While oxblood conjures up images of pools of blood, it's hardly that gory. In fact, oxblood is the hottest color going right now. 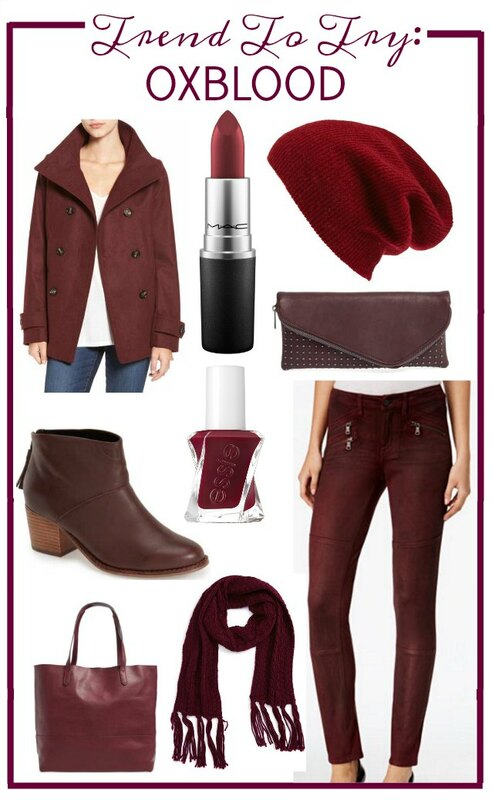 It's a deep, rich shade of red similar to burgundy but with hints of purple and dark brown. And with the holiday season around the corner, oxblood is a welcomed departure from traditional red. Here are a few fabulous ways to wear this trend this winter. I typically go for black coats, but I am loving the color of this peacoat (and the price, too!). This deep shade makes a great substitute for a black coat and would pair nicely with just about anything you are wearing. Around the holidays I love to kick up my lip color a notch. This universally appealing color works well with any skin tone. Just be sure to keep the rest of your makeup on the subtle side. Bad hair day? Here's your solution for turning a bad hair day into a super cute one. The studded detail on this clutch sold me. Although I would use it for a formal holiday occasion, it certainly is perfect for a casual night out. Skip the brown and black booties and go with this pair. The color works well with any color denim, and you can show off the tassle detail when wearing a dress or skirt. I am totally guilty of wearing this shade of nail polish all too often. But, hey, why not? It's gorgeous! Getting a little sick and tired of the same old weekend outfit? Swap out your favorite jeans for these faux suede moto pants. A must when I am out holiday shopping? A large tote. I have got to have one to stow all my stuff and I like to use it to corral all the small bags I have. If you just aren't sure about wearing this trend, a scarf is a good way to get your feet wet. At this price point, if it doesn't work out, there will be no regrets. Have you been spotting this trend on the streets? What items have you seen that you love?